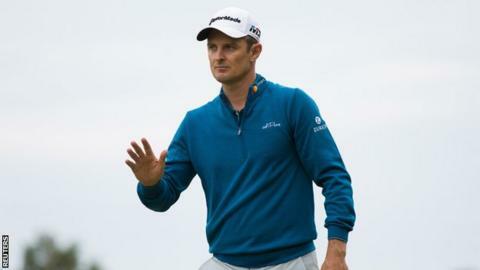 Justin Rose shot a six-under-par 64 to take the BMW Championship lead after round three in Philadelphia. The Englishman is one shot clear of Rory McIlroy, who moved up into a share of second with overnight leader Xander Schauffele after a seven-under-par 63. Tommy Fleetwood is level with Rickie Fowler one shot further back after scoring an eight-under-par 62 for the second successive round. Tiger Woods moved up to joint 11th with a four-under-par 66. "Tomorrow will be gruelling, it's set to rain all day and it will be a battle," Rose told Sky Sports. "Just getting round will be a win I think, perhaps the weather will help keep me distracted but a one-shot lead with a chasing pack behind doesn't mean much."